With the return of spring, brown marmorated stink bugs are on the move. After rollicking our way through one of the warmest winters ever, spring has sprung and stink bugs are on the move in homes and offices, accumulating on windowsills, walls, and doors and buzzing about indoor lights at night. Why all the activity at this time of year? The answer lies in the age-old pattern of life crafted by the stink bug to survive the ravages of winter and emerge just in time to take advantage of bountiful leaves and fruit found on plants each spring. Millions of folks in the middle-Atlantic region were treated to invasions of stink bugs last autumn as the horde sought refuge in homes, schools, and office buildings. Many people mistakenly believe that stink bugs enter buildings in winter to “get warm", but this is not the case. In the natural realm where stink bugs evolved over millions of years, stink bugs sought winter refuge in sheltered spots like rocky crags, fallen trees, or tangles of brush in the forest. Protected from the onslaught of winter, stink bugs chilled out and entered a season of inactivity akin to hibernation, while awaiting the return of favorable temperatures and springtime food. Lengthening days of spring warmed the cliffs and forests and signaled the return of leaves, flowers, and fruit. With the return of food sources, stink bugs answered Mother Nature’s wake up call and moved from their refuges to the greening landscape. During the recent weeks of crazy warm weather, we’ve witnessed an early explosion of flowers and leaves on trees, shrubs, and herbaceous plants. Inside attics or beneath the siding on homes, these unusually warm days have convinced stink bugs that spring has arrived and that it is time to return to the wild to seek food and pursue the biological imperative of finding mates and laying eggs. With our average daily temperatures hovering at summer-like levels, stink bugs have begun their springtime exodus from our homes into the natural realm. Due to warm temperatures this winter, there was little respite from stink bugs. In my home, not a week passed that I did not collect a stink bug or two wandering about the kitchen or living room. But as of this week, the trickle has turned into a flood and I collect a half-score of stinkers daily. As you deal with stink bugs this spring, here are some things to consider. 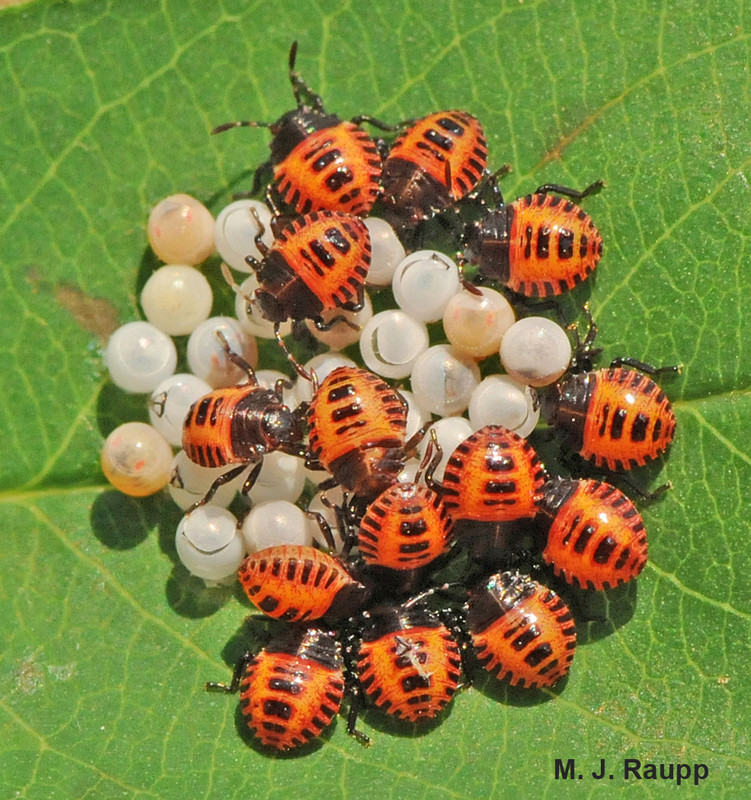 The pearly eggs and brightly colored newly hatched BMSB nymphs are not difficult to identify. Recently, I was asked if “stink bugs breed in my home?” The answer to this question, to the best of our knowledge, is no. In the normal course of events, stink bugs move from winter refuges to plants outdoors where they must feed for several weeks before they become competent to lay eggs. In your attic or an unused bedroom there is simply no food to provide the sustenance needed by stink bugs to produce eggs. Even if a stink bug laid eggs indoors on a windowsill or wall, there would be nothing to sustain the young bugs, which require plant food for growth and development. Having made this claim, I might back-peddle just a little, as we are receiving reports of stink bugs feeding on house plants such as orchids and potted ponytail palms. Will they lay eggs on houseplants indoors? One homeowner discovered a batch of stink bug eggs on a houseplant late in the spring. So the ultimate answer to this jeopardy question is 'yes.' However, the chances of stink bugs sustaining a population in your home probably lies somewhere between zero and nil, unless you have bountiful fruit bearing plants in your home and do everything to ignore stink bugs dashing about on your plants. 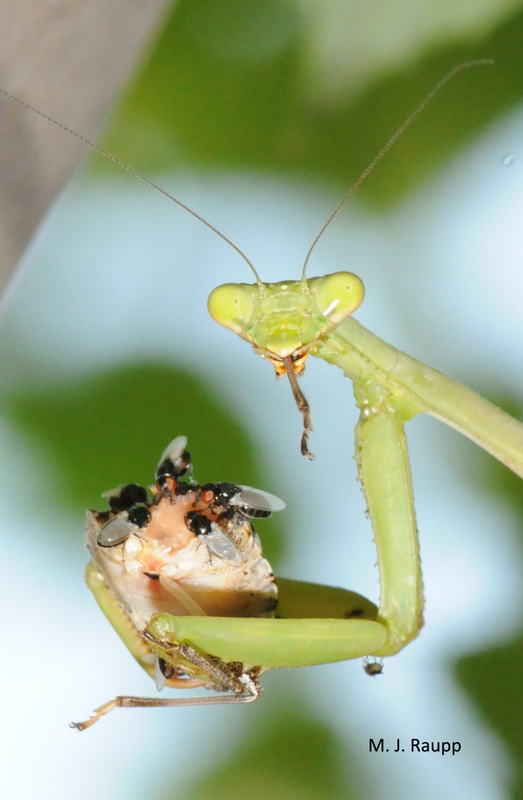 One farmer reported an outbreak of praying mantids in his stink bug-infested field. Let's hope this lass left behind dozens of hungry youngsters with wicked appetites for stink bugs! Another question that always comes up is, “what should I do about stink bugs that appear in my home this spring?” Sweeping, vacuuming, or simply picking them up and disposing of them is still our recommendation for control indoors. Because they will be active for a relatively long period of time, and to reduce exposure of homeowners and their children and pets, we are not recommending the application of insecticides to indoor living spaces to control stink bugs as they appear. Will stink bugs be as problematic this year as last? As stink bugs continue to spread and our region becomes generally infested, more people will witness stink bugs on their vegetables, fruit trees, and landscape plants outdoors, to be followed by domestic invasions of stink bugs in autumn. My home has been graced with more stink bugs in 2012 than in 2011. The unusually warm April of 2010 seemed to favor insects of many kinds, including stink bugs. If record warmth continues in 2012, will stink bugs enjoy another banner year? Only time will tell. But the news on stink bugs is not all bad. On a regional scale, most people agree that there were fewer stink bugs at the end of 2011 than in the watershed year of 2010. The cool wet autumn and elevated levels of predation and parasitism have been offered as potential explanations for this decline. What can be done about stink bugs in the long term? More than 50 scientists throughout the region and across the nation have banded together in a major research effort to thwart the continued depredations of this nefarious bug. We will explore all possible methods to thwart these rascals including the use of traps and trap crops, release of natural enemies, development of natural, synthetic, and microbial insecticides, genetic manipulation to kill the bug, modification of the bug’s habitat, methods to exclude and remove pests from homes, and the use of stink bug resistant plants to design them out of landscapes and prevent them from entering your home. To learn what to do when stink bugs get inside and how to keep them out, watch the following video.